Re-enrollment I know it’s only April, but this is when we begin planning next year’s curriculum purchases, teaching assignments and more – all based on projected enrollment. 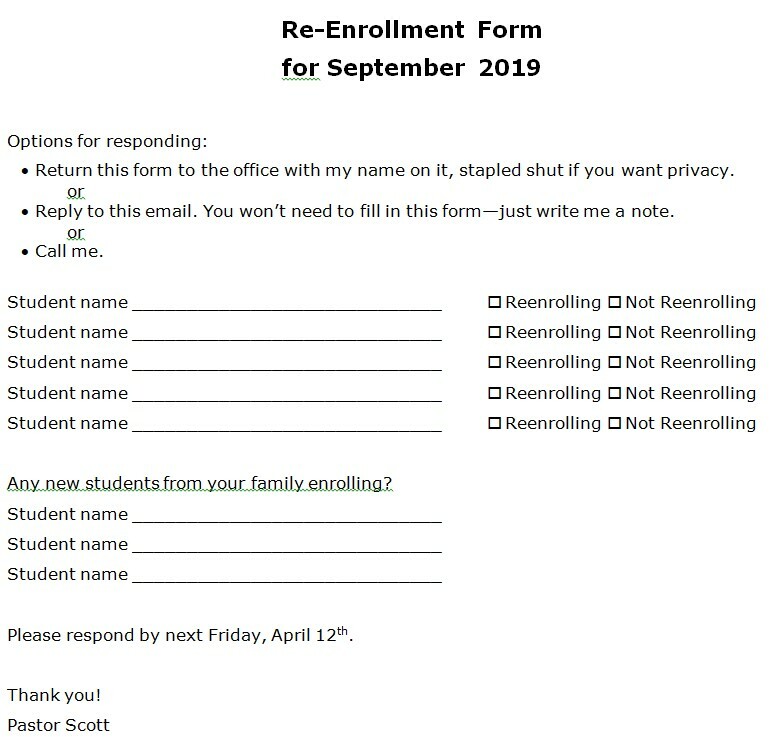 To wit, a re-enrollment form is attached to this email and printed below. Even if you’re not 100% sure what your plans are, your best guess will be very helpful. If you indicate you’re planning to re-enroll your children, you’re not making a commitment and you shouldn’t feel like you’ve obligated yourself. If you indicate you’re not re-enrolling, you don’t need to feel funny or be afraid of running into me in the hallway. I’ll never ask you about it or confront you in any way. I’ve never felt it was my position to talk people either into coming to the school or staying – that decision is yours alone. This information is for my eyes only. No one else will know your intentions. Please respond by next Friday, April 12th. Thanks for your cooperation. Resource Room I’m still looking for a Resource Room Teacher to replace Mrs. Torzon, whose last day is next Friday. This is a full-time paid position, providing learning support one-on-one and with small groups of students in all grades. Of course, any applicant must be born-again. Ideally, the first day on the job would be Monday, April 22nd. If you are interested or know of anyone who I could call, please contact me. Yearbook orders need to be placed online by May 1st if you want to receive yours before the end of the school year. They are $25.31. If you run into any problems or can’t order online, write to Miss Lindsay Schell at Lindsay.schell@fingerlakeschristianschool.com. Leggings or other form-fitting pants/shorts are allowed only if they are accompanied by a loose top that comes down below the rear end, and the same length in front. Visible piercings or tattoos are not allowed. Earrings for the girls are allowed. If hair is dyed it must be a natural color.